The U.S. Department of Transportation gathers essential data on the US aviation market. The DOT module makes it accessible to the industries and professionals who need to use it most. View U.S. airlines’ profitability, passenger load factors, fuel costs and employment statistics in one flexible tool. 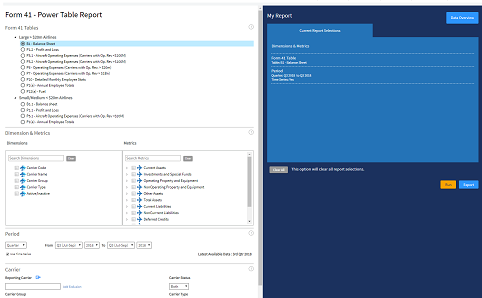 Our DOT module combines data from T100, Form41 and O&D (DB1B) reports into one accessible web-based portal. What are the key trends in the U.S. aviation market? How can I analyse US schedules and connections data for route planning and network analysis? What are competitors' capacity and offerings? Where can I see unique historical DOT aviation data? Deep dive into the U.S. aviation market with exclusive analytics from OAG. 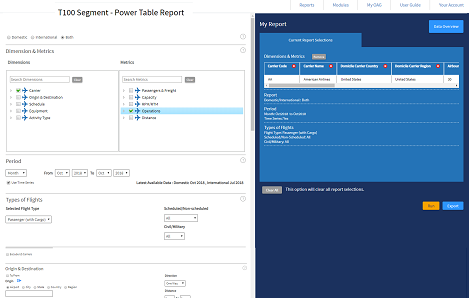 T100 Power Table – analyse T100 Domestic and International Traffic data across different dimensions – airline, departure/arrival airports, city, country, state, and region and by month, quarter or year. Analyse T100 Domestic and International data across different dimensions. 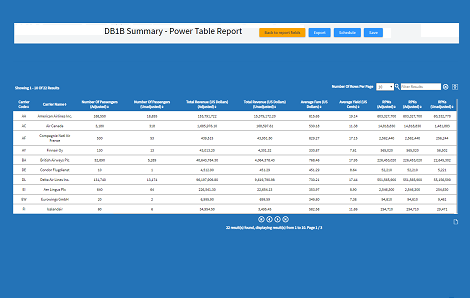 O&D DB1B data to analyse passenger counts, revenues and average fares. Aggregated Form 41 data with DOT US certified airline schedules data for financial analysis.